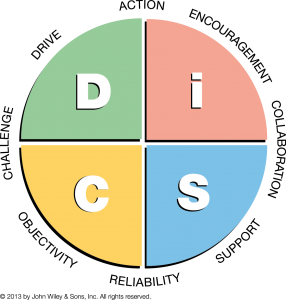 Introducing Everything DiSC® for Every Interaction at Every Level! Lack of engagement, understanding and poor communication can cause daily havoc in the workplace! If you are dealing with any of these challenges perhaps the time is right to discover how Everything DiSC® can work for you! Motivation and Management is all about knowing yourself and understanding the priorities of your people! Each profile is topic-specific, with in-depth information, including tips, strategies, and action plans to help participants become more effective communicators and employees. Address challenges related to increasing sales, reducing conflict and empowering leaders to better understand the priorities of their people. This profile can be used with everyone in an organization, regardless of title or role, to build more effective relationships, and improve the engagement and productivity of the workplace! This profile teaches managers got to bring out the best in each employee. They learn how to read employee styles and adapt their own styles to manage more effectively! Helps salespeople connect better with their customers by understanding their customers buying styles, and adapting their sales style to meet their customers buying styles. The Work of Leaders made simple: Vision, Alignment and Execution. Based on best practices Work of Leaders connects the real-world demands, generating powerful conversations that provide a clear path for action! Everything DiSC® Facilitation Kit: To master the Everything DiSC® effectiveness our facilitator kit includes team strengthening activities, video content, individual activities and creative ways to talk about and coach those who have taken any of the above Everything DiSC® products. Gain insights into your own behavior and that of others! Anticipate and appreciate the style of your peers, boss and direct report! Learn how to communicate and persuade more effectively in sales and management! Work more cohesively and collaborative with your team! Resolve your People challenges Now Request a Demo Today!